Packet of three: keep your nanoSeries controllers safe with the nanoBag. Although we've never been massive fans of the nanoKey keyboard, Korg's other two nanoSeries controllers - the nanoPad and the nanoKontrol - are firm MusicRadar favourites. We're by no means alone in taking these dinky devices to our hearts either - mobile musicians around the world have embraced their diminutive charms. In fact, some people love the nanoSeries controllers so much that they've bought two or even all three of them; if you fall into this category, Korg has a couple of new accessories that you might be interested in. First up, there's the nanoBag, which is designed to hold and transport the whole nanoSeries collection. 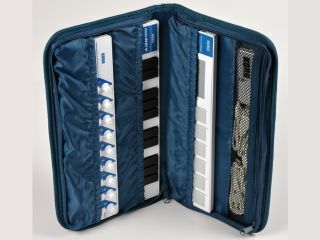 Each controller can travel first class in its own compartment, and there's also an additional section that's designed to hold the second of Korg's new nano peripherals: the nanoHub. This, predictably enough, is a USB hub; it contains four ports so takes care of all your nano needs and gives you a spare port to play with, too. The nanoBag and nanoHub are available now as a single package priced at £19.99.